Maternity sessions can be for parents and siblings too! They are a great way to show the growing relationship between you and your baby on the way. The session will take place at an outdoors location or in our private studio in downtown Palatine. The whole family can get involved if this isn't your first baby. It is a great way to show the excitement and anticipation of the arrival of baby by your other children. 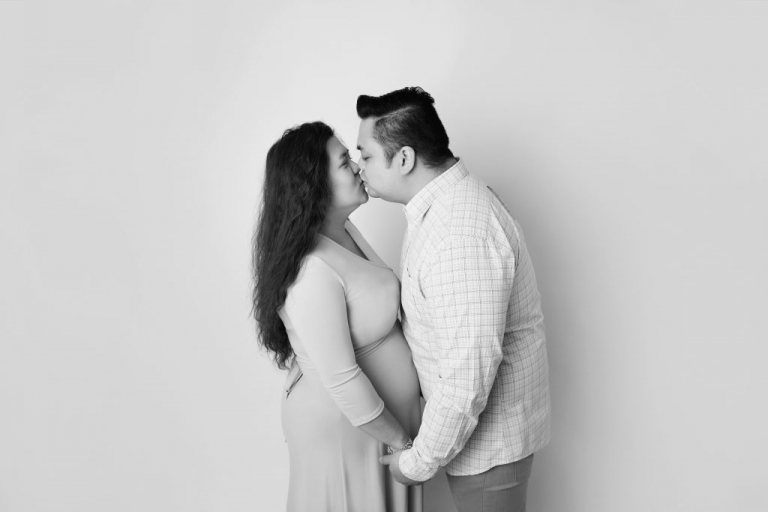 These sessions are more intimate and will focus on mother-to-be's beautiful growing belly and the bond forming between you and your baby on the way! The joy and emotion captured before baby arrives is truly something that will be cherished for years to come. It is a great idea to book your session as soon as possible in your pregnancy, usually early in your second trimester, to ensure space on our schedule and give us plenty of time to plan. Maternity sessions are most successful during weeks 32-36 but we are able to accommodate at any stage in the pregnancy. Most of our maternity clients choose to book a newborn session at the same time. This provides the most savings and allows us time to plan both. Parents-to-be are welcome to schedule an appointment to visit the studio and meet me. Just contact me to check availability for a planning appointment. Planning appointments are scheduled mainly on weekday evenings but let me know if you can't make it at that time and would prefer to schedule one. I encourage you to set up this meeting so that you can meet the person you are considering to photograph your family and possibly your newborn photographer. This meeting is complimentary and allows you the opportunity to meet me, see the studio and our variety of maternity gowns and dresses, ask questions, share your concerns, and even get started planning your session! I would love to meet you and hear about your expectations for your session. I'm completely focused on providing you with the best experience possible. If you do not want to schedule a planning appointment, we can have our consultation by phone or email to plan your session. Please click the contact button above to request a full product catalog and price list. Digital packages start at $299 and digital files with quality artwork packages start at $499. All products and digital files are purchased separately and are not included in the creative fee above. The $100 creative fee and a signed portrait agreement are required to book your session. For sessions on location, Just Peachy Photography will travel up to 20 miles from Palatine, IL. If you are beyond this area, inquire about traveling fees. family, click here to view the newborn page. Interested in a newborn session?